I've had this pattern for years and didn't think to use it recently until Gina over at Beauty from the ashes used part of it to make her fabulous sailor dress. I finally took a hard look at it and realized the skirt actually is pretty good for what I wanted with only minor edits. The blouse I used mostly because I loathe trying to draft/drape collars. The pattern uses five panels total - which is fine based on patterns from 1906. 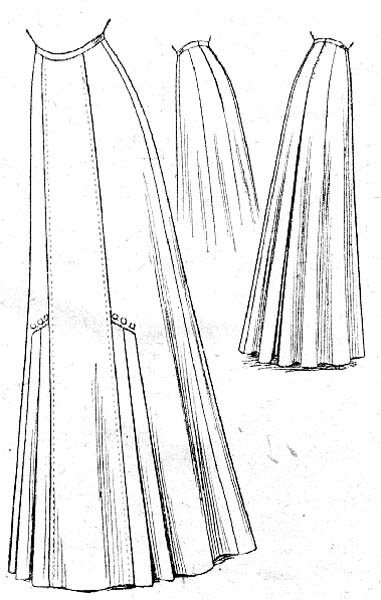 There are a couple of five piece/gored skirts from 1906. However, I had to figure out what Aunt Maggie was wearing. In the photo of her looking down towards the photographer, you can pretty clearly see a pleated kick pleat on one side. The pleat is angled slightly, going up towards the hip. However, there doesn't appear to be much more in terms of any decoration. But fuller and with the gore angled the other way. For the fabric, I chose a lightweight wool blend I had on hand. It's simply what looked the most correct visually for this style of skirt. I cut out the pattern pieces - using only the skirt panel pieces. The waistband is just a strip of the same material. The kick pleated gores I cut from what was left of the material. After sewing the back, I pinned the front of the skirt up to see where to place the gore. I cut the side panel of the skirt back and at an angle to fit the pleated gore. Close up of the gore. It's not the most interesting of skirts but it is practical for everyday wear with just a hint of interest. I really liked wearing it. I think it balances well with the pintucked shirtwaist. Pattern: As a sloper, I used Simplicity 8375. 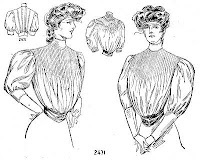 I also used this pattern from 1906 to get an idea of what the pattern shape should be for the shirtwaist. I edited the skirt pattern as well, adding gores and making a different waistband. Notions: Thread, the belt, vintage deadstock lace, a small sewing kit that hangs from the belt in the pictures, a locket, hooks and eyes, buttons! How historically accurate is it? If it weren't for the wool/acrylic blend I used for the skirt, it would be nearly perfect. Hours to complete: Two weeks of research, maybe two days of actual sewing? Total cost: The linen cotton blend is the stuff I get at Joanns so maybe $10 for the couple of yards I used? The lace was stuff I had in the stash - I got a huge hull years ago from someone clearing out their grandma's sewing closet. The laces were all antique and they were often wrapped around pieces of cardboard -never used. The wool for the skirt I got at the thrift store for $3.90 for the entire yardage. The belt was maybe $1 at the thrift store as well. The locket I think was Aunt Maggie's and the sewing kit was Aunt Nan's...I'm have gotten the reversed. I'm not sure. Either way, it belonged to the people in the original photograph. Notice the pleated kick gore? Yeah, had to recreate that. You can see she has something small hanging from her belt. You'll see the sewing egg I used soon enough. She also wears some sort of locket looking necklace, so I used one that I think belonged to Aunt Nan, her sister. Because I have yet to find any sisters anywhere in the world that don't "borrow" each others stuff. Ever. The difference between 1906 and now (or even really a few years ago), is they've built a wall. You can still see where Aunt Maggie sat down, but it's about two yards past the railing. 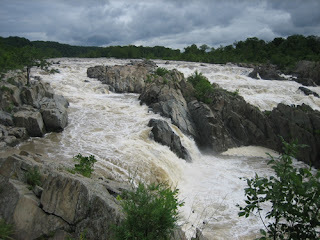 I remember the outcry a few years back when yet another person fell and drowned in the rapids. They built the wall in response...not that really stops a lot of people. The water level is also lower than normal. We haven't had a good rain since early July. Where they took the rock picture has a bit of a tree in the way - you can see it to the right of me. I did see it and try to recreate it a bit but it was very shadowy. This spot looked better - even if I am trying to control Abby. You can just see the kick pleat in the bottom part of the picture. All and all, I'm extremely pleased with the outfit. I love the shirtwaist/blouse and had fun wearing the outfit at the same spot Aunt Maggie wore something similar over a hundred years ago. Really, I just folded part of the sleeve pattern back and redrew that part on the other side. It takes all of a minute. One of the big things was making all the tiny pintucks. I went with 20 of them. This is Abby plus the fronts and backs of the shirtwaist, sewn at the shoulders, and the 20 pintucks. I also added pleats to the back, as per the extant pattern, which honestly add a nice detail once the blouse is completed. After making all the pintucks, I wanted to add the antique lace. It's deadstock lace - never used- so no one took apart any dresses to get it. Not that I'm completely against that - I just don't like seeing one little tear and the next week seeing all the appliques up for sale - the dress gone and thrown in the trash. We need these items to learn from and you can't learn from what isn't there anymore. Anyway, I pinned the lace to each of the pintucks and sewed it down. It was a bit worried about the lace but it turned out fine. The shirtwaist without sleeves! I added lace to the collar since it needed something. 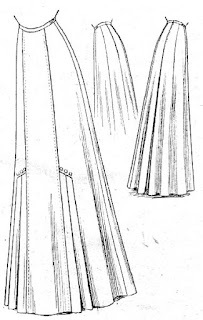 The pinned back pleats. I kept playing with these. Eventually, I sewed them down to give a puffy impression in the back so that the pleats would stay put. The almost finished shirtwaist! It still needs buttons and to be gathered more at the waistline but it's clearly a blouse now. :-) I didn't have a lot of lace left so I used what I did have to make a small detail on the sleeve head. Just a touch of lace continuing on to the sleeve. It helps to get rid of that plain look, I think. Detail of the sewing patterned lace. It came out well, I think. I'm at least happy with it. The finished back minus the buttons yet. I only sewed the pleats to the waist - this way, the hip area is still free. 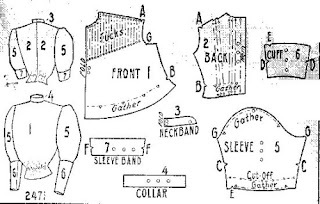 Re-create a garment one of your ancestors wore or would have worn, or use an heirloom sewing supply to create a new heirloom to pass down to the next generations. There is a LOT of interpretation in this one. I decided I wanted to go with recreating a garment an ancestor would have worn - and hit the attic at my parents house. My Goodness! Did I find a treasure trove! I found a TON of photos of my Mom's paternal family. I only ever knew my Papa (Mom's Dad) and my Aunt Elva (technically a cousin by marriage as I found out!) from that side of the family. Most of the others passed away long before I was born. However, thanks to my Mom, I have heard a lot of stories. Mom has always told me I'd get along great with Aunt Nan. Aunt Nan was one of my Papa's aunts. She apparently had an affinity for anything turquoise or pink as well and always had a ton of fashionable accessories. Over the years, I've inherited some of both hers and Aunt Maggie's (her sister) jewelry and gloves. I've been wearing some of her gloves from the 50's and 60's to various events over the past couple of years. I'm just glad I have the same size hands as she did! A group of photos stood out when I was going through the ones in the attic. These photos stood out for a couple of reasons - I love Aunt Nan's and Aunt Maggie's outfits (Aunt Nan is wearing the lighter colored skirt and Aunt Maggie has the darker one - plus she always has her glasses) but also I KNOW THAT PLACE!!!!!! Notice, that "seat" in the rock is still there. It's Great Falls. My parents' home is maybe 10 or 15 minutes from there on the Maryland side. I've been there a ton of times and recognized it immediately. 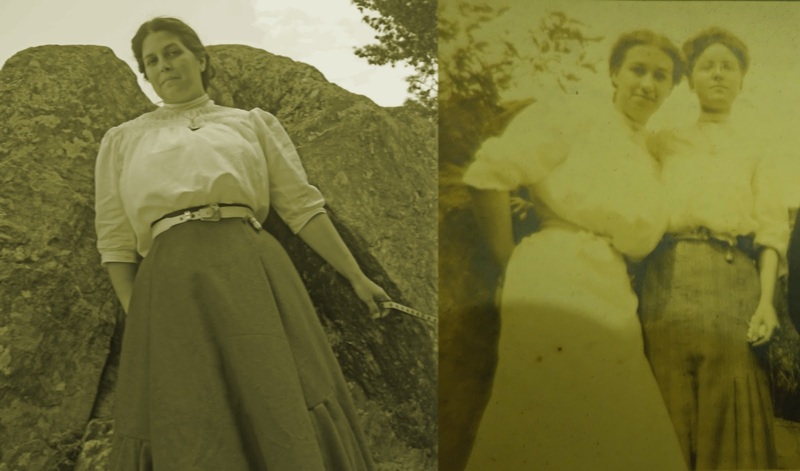 So, for fun, I decided that I have to recreate one of either Aunt Nan's or Aunt Maggie's outfits and go to Great Falls to partially recreate the photo. Based on what I have in the sewing stash, I decided on Aunt Maggie's outfit. I have a light weight red wool that would work for the skirt and a nice off white linen for the blouse. As for the corset and undergarments, I'm cheating and using my Teen's era stuff. The photos are probably from about 1906/1907 based on what they are wearing. Going off that, I did a LOT of research and hemmed and hawed about what I wanted to do exactly. It's hard to tell what is going on in terms of details with Aunt Maggie's blouse and her skirt. I can see a bit more with the photo of them looking down at us, but still it's hard to say what is really going on. 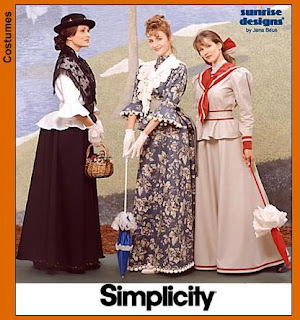 So, for a base, I'm using Simplicity 8375. I've already edited it a lot for the blouse as I really just used it as a sloper. I have no doubt that the skirt will need some editing too - but it's something I can work with to get the correct shape if nothing else. The skirt is a three gore one which I know they were still using in the mid Edwardian period. The above is what I eventually decided I wanted the blouse to look like. It's from The Ladies Home Journal 1906 via Real Historical Patterns on Tumblr. If you don't know about Real Historical patterns yet, you can thank me later. 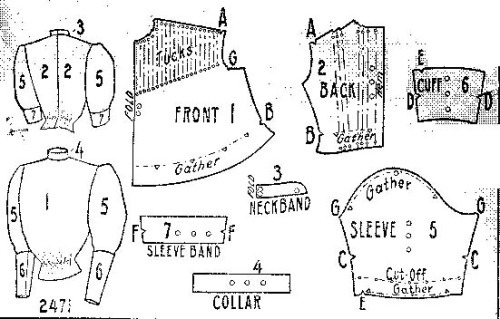 It's a fabulous resource for pre-1929 patterns. 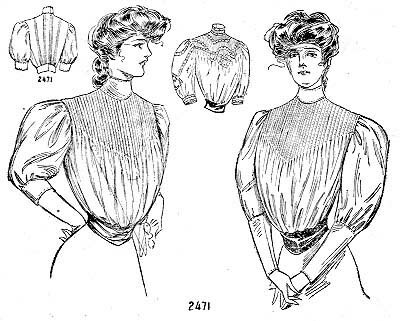 For this shirtwaist, I love the pintucks and I like the idea of adding lace over the pintucks. No only does the pattern show that as an option (the tiny blouse between the ladies heads) but there's this extant one over at my other blog that shows black lace over fabric rather than the insertion we are used to seeing during this time period. I'll sew up the pintucks and the shirtwaist tomorrow to see how it goes. I'm hoping this will turn out well and look just as cute as Aunt Maggie's original blouse. For the lace, I happen to have a lot of vintage deadstock lace that will work well. The one I'm using might actually be Edwardian. It looks very similar to the lace that is on the extant gown I've linked to above. I think it will add a nice frilly touch to the blouse. For the skirt, I'm working on that tomorrow as well. More progress photos and the final product over the next few days!